The Epoxies released their debut album with local label Dirtnap Records to much underground acclaim. Endless touring and word of mouth about Roxys tireless stage presence landed The Epoxies follow up record, Stop the Future, on punk kingpin label Fat Wreck Chords. The bands influence and Roxys unique vocal stylings and stage persona reached far and wide. 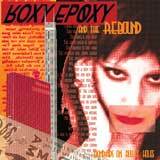 Roxy Epoxy has been compared with admired artists such as Chrissie Hynde, Siouxsie Sioux, Lene Lovich and even a young Leonard Graves (Dickies). While the Epoxies toured and recorded extensively, Roxy continued to write songs and put them aside. She also tried her had at writing for Razorcake Magazine and started her highly influential radio show, Roxys Ego Hour at KPSU radio. At the end of 2007, the Epoxies decided to call it quits, but Roxy wasnt finished yet. It was time for Roxy to pull her own songs out of hiding and start fresh. She began writing new songs and found talented musicians to follow her into the studio. The result was Roxy Epoxy and The Rebound. Their debut album, Bandaids On Bullet Holes, presents the next logical step for a post Epoxies world. The mood is darker. The guitar is crisper. The angles are sharper. One fellow local musician has been overheard to say that the material is even better than the defunct Epoxies.